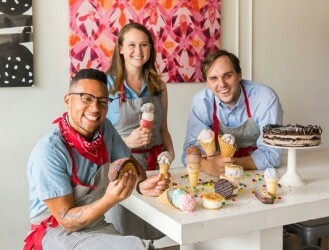 Clumpies Ice Cream Co. has been handcrafting the best ice cream in Chattanooga since 1999. Opened by the son of a third generation candy maker, Clumpies has sought to create a product as amazing and one-of-a-kind as the city where it started. The business changed hands in 2013, but our mission is still the same: Serve every guest that walks through the doors incredible ice cream, and create unforgettable memories worth repeating. Each batch of Clumpies ice cream is made by hand with only the finest ingredients that can be found. From our ice cream mix that we pasteurize ourselves from fresh milk and cream to our house made cookies, cakes, chunks, jams and sauces that we swirl into our ice cream, we always strive to make the best ice cream around. We churn our ice cream in small batches, ten gallons or less at a time. That micro-batch process allows us to care for and consider each scoop of ice cream that we serve. The result is a rich, creamy, delicious ice cream crafted with care. It may take longer, but we think it makes our ice cream that much better. We love to partner with like minded folks, committed to making products of the highest quality, in our hometown of Chattanooga and the surrounding area. Below are a few of those companies and producers that we work with: Pure Sodaworks, Chattanooga Coffee Company, Mad Priest Coffee, Signal Mountain Orchard, Walden Ridge Honey, Chattanooga Whiskey, Oddstory Brewing, Hutton & Smith Brewing.